Evening Shoes with Matching Handbags, London. Now that you have the dress, complete your look with a stunning pair of shoes and matching clutch bag from the amazing collection of glamorous evening shoes and bags at J’adores, just off the Old Ford Road in Victoria Park. J’adores is a specialist shoes & bags boutique, highly experienced in all aspects of evening shoes and evening wear accessories. Established in 2003, its mission is to offer outstanding quality and comfort at a reasonable price. This is an award winning store, whose accolades include Mahogany Brides ‘Bridal Accessories Company of the Year’ two years running, so you know your feet are in good hands. Company director Anthonia Onigbode has built up an impressive collection of independent shoe brands that you won’t find on the High Street. These shoes are handcrafted by experts mainly in Italy and Spain. The emphasis is on design, craftsmanship, quality and comfort. The result is a stunning collection of glamorous evening shoes in a breathtaking array of colour and designs. Brands: Currently include Rodo (Italy); Giorgio Fabiani and Marino Fabiani legendary Italian designers famed for their excellent fit; Menbur of Spain; Bourne cosmopolitan British brand; Guess (small selection); Brazilian designers Mauricio Medeiros and Imagika; hand bags from Smiths & Canova, Claudia Canova bags (British designers) and Charlotte Reid (Bags). J’adores also has its own in-house label, handmade in Italy. Prices range from £70 to £499 for matching shoes and bags. 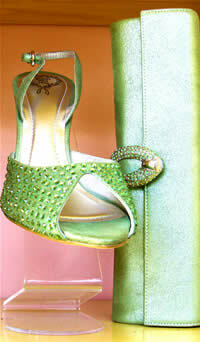 J’adores offers a bespoke shoe design service for bride and bridesmaids. 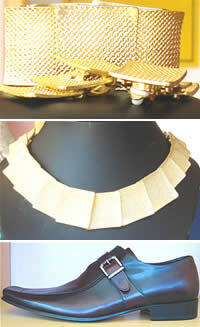 Evening and bridal accessories: J’adores' costume jewellery collection will add the perfect finish. Consultations also available on wedding jewellery and accessories. J’adores works with Parisian Jewellery label Dolce Vita and with Designsix Jewellery. Mens shoes: J’adores stocks a small collection of exquisite handmade leather shoes for men. The shoes are of excellent quality, handmade in Italy by Gianfranco Butteri, prices from £80. Makeovers & Cosmetics: J’adores also sells Mary Kay Cosmetics and offers beauty consulting. Getting there: Bus 8 from Liverpool Street Station brings you direct to the store. Monday to Saturday 10.00 - 18.00. Late opening on Thursdays by appointment.